Summary: Hinduism has elements of both monotheism and polytheism. Hence it is difficult to classify it into a particular category. 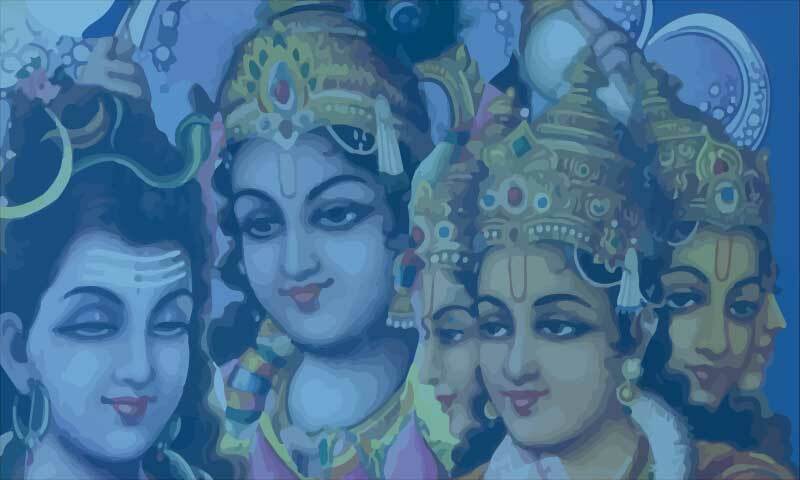 In this essay we have presented a brief description of the gods and goddesses of Hinduism and their significance in the Hindu pantheon. Hinduism is the oldest living Dharma in the world. It cannot be strictly defined as a religion in the western sense because it is a basket of numerous religious traditions that originated in India, some of which are comparable to world religions and even enjoy greater following than some of them such as Judaism, Jainism and Sikhism. The word Hindu was originally a geographical name, which during the medieval period became associated with all the religions that originated in the Indian subcontinent. However, currently it includes all the religious traditions of Indian origin except Buddhism, Jainism and Sikhism. It is difficult to characterize Hinduism as either monotheistic or polytheistic because Hindus not only worship multiple divinities but also Brahman, the Highest and Supreme Universal Self, as the creator, sustainer and the Lord of all. The one Supreme God is believed to manifest Himself as many gods and goddesses, such as Brahma, Vishnu, Siva, Lakshmi, Parvathi, Saraswathi, Indra, Varuna, Mitra and so on. At the same time each of the divinities is perceived and worshipped as Brahman only in his or her ultimate essence. They are looked upon as his innumerable forms and functional aspects, who along with Prakriti or Nature carry out the different tasks of God's creative plan and execute his blueprint of the universe. Scholars tend to categorize Hinduism as either henotheism or kathenotheism. The former is belief in one god without denying the existence of other gods. The term was originally used by Max Müller to describe the Vedic religion. Kathenotheism, is a slight variation of the former, which refers to the worship of several divinities each considered to be a supreme god. Strictly speaking, both definitions do not apply to Hinduism because it is not a monolithic religion like others. Its numerous traditions contain elements of monotheism, polytheism, henotheism and kathenotheism, but does not fully fit into any particular belief system. Brahman is described in Hindu scriptures as both immanent and transcendental. In His transcendental aspect He is described as the known and the unknown and so also as one with qualities (Saguna Brahman) and without qualities (Nirguna Brahman). In His unified and absolute aspect He is Parameswara (the Highest Lord) and in His creative and functional aspect He is Isvara (the universal Lord). In addition to gods and goddesses, in Hinduism we also come across the worship of many objects such as trees, plants, rivers, lakes, snakes, hills, the various planets, some stars, constellations, the sun, the moon and so on. Many saints, babas and sages are also objects of their veneration. In the Vaishnava tradition, the images of God are also considered divine and incarnations of God (arca), having various levels of his potency. Hindus worship the gods and goddesses variously adding further complexity to the manner of worship in Hinduism. They may worship them all or only some of them at a time, or venerate each of them separately as the Supreme God himself. Generally, the present trend is that most of the Hindus believe and worship many gods simultaneously in the hope of receiving blessings from many of them. Sometimes this may even create confusion in their minds about whom to worship in a given situation. However, most of them resolve these problems in their own individual ways. There are traditions according to which each Hindu god is to be worshipped on a particular day in a week, month or year and many follow these traditions. There are specific rules and regulations to be observed by the devout Hindus while worshipping them, which involve performance of specific rites, rituals and chanting. Many observe these rules with great sincerity. Polytheism is an integral part of Hinduism, in spite of opposition from certain intellectual quarters over the centuries. After contacts with Islam and the Christianity of the British, attempts were made by some educated Hindus like Raja Rammohan Roy and Keshab Chandrasen to discourage polytheism. The reformist movements like Brahmo Samaj and the Arya Samaj were products of such a reaction. However, their impact did not last long as is evident from the way present day Hindus visit the temples and worship various gods, observe the festivals and celebrate the glory of gods and goddesses, perform pujas and vratas whenever the occasion demands. They may listen to the discourses of enlightened people, go through numerous books on religion, but they hold their gods and goddesses to their hearts dearly and worship them with deep devotion and sublime faith. There is certain purity and innocence in their faith and approach which are rarely seen elsewhere. An average Hindu, who is fully devoted to his religion is very clear in his mind how he should conduct his faith. He worships gods and goddesses because he believes in them and is sure of their existence in the higher worlds of God's creation. He models his life on the values which they uphold and regulate his behavior according to their teachings and instructions. For him life without them is simply a sacrilege, which he is sure he cannot afford. It is not the for the sake of society or family, though that is not entirely absent, but for himself and his own welfare he worships them and holds them with regard in his mind. On a given day a devout Hindu may worship his gods or goddesses in the morning, noon or in the evening or whenever he chooses to, even while his mind is busy with worldly matters. He may worship them in the comforts of his own house or visit the near by temple or shrine. In the past there were violent clashes and heated debates among the followers of divergent sects and schools of Hinduism. It was especially intense between the follower of Vaishnavism and Shaivism. However, presently you do not find such rumblings since all the sects have become integrated into mainstream Hinduism as one composite system, which is universally followed by a majority of Hinduism. Today, Hindus accept all the gods of the Hindu pantheon as part of one large, divine family, without any conflict or rancor in their minds. The gods of Hinduism belong to different worlds and planes of existence and assist the mankind in various ways. At the highest level, there are the three gods, namely Brahma, Vishnu and Mahesha, each ruling a particular divine kingdom as the lord. Brahma is the creator, who rules Brahmalok, (the world of Brahma), and engages Himself in the process of creating forms and breathing life force into them. For various reasons Brahma is not worshipped the way the other two gods of trinity are worshipped. There are in fact very few temples built in his honor. However, his consort Saraswathi, who is the goddess of learning, is worshipped by many, especially the students or the brahmacharis of the Vedic schools. She is frequently found in the company of Ganesha and Sri Lakshmi, the goddess of wealth and the consort of Lord Vishnu, and receives honors and prayers along with them. Vishnu is entrusted with the responsibility of maintaining the worlds and looking after their welfare. He rules Vaikunth. He has a number of followers all over the world who regard Him as the Supreme Lord. A number of temples have also been built in his honor right from the post Mary period. Though He was a minor deity in the early Vedic period, he became very popular with the rise of Vaishnavism during the subsequent periods. Some of his incarnations are also worshipped in many parts of India, and they attract wider following among people than Himself as Vishnu. Most famous among his incarnations are Lord Rama and Lord Krishna, the heroes of the epics, the Ramayana and the Bhagawatha. They have millions of devotees all over the world. Lord Balaji, is also equally famous. His temple at Tirumala in Andhra Pradesh is reckoned to be the richest in the world and attracts a huge number of devotees throughout the year. Lord Vishnu is also worshipped as Dhananjaya, Narayana, Anantasayana, Kapila, Narasimha, Varadaraja, Srinivasa and Jagannatha (of Puri temple). His consort Lakshmi, the goddess of wealth is equally popular. She is worshipped in many households regularly, especially by the seekers of artha or material wealth. She is also worshipped variously as Padma, Kamala, Sita, Narasimhi, Varuni etc. Lord Siva is the destroyer of the worlds. He is the supreme yogi who is easy to be pleased. He is as popular as Lord Vishnu, and he is the chief deity of Saivism, which also became popular in the same period as Vaishnavism. In fact, a long rivalry existed between the two, each side claiming their supreme deity to be the Supreme Lord of the universe. While Vaishnavism caught the imagination of the householders and seekers of material comforts, Saivism captured the imagination of renunciants ascetic people and seekers of liberation. Today both these gods are extremely popular across the length and breadth of Hindu society. References to Siva can be found in the Rigveda where in he is referred to as Rudra, the god of anger. According to some Siva is not the same as the Rudra of the Vedas. Whatever may be the truth, Siva is also known as Rudra because of his nature to show bouts of occasional temper. His anger is the anger of righteousness, not to be confused with the petty anger of the human beings. It is born of out of a specific divine purpose to destroy something in order to create something new. It is the manifestation of an energy whose intent is to create purity of purpose and harmony of structure in the object of destruction, but not to destroy something for the sake of destruction only. He is the destroyer of negativism and egoism and purifier of the consciousness with his abundant grace. He resides in kailash on the top of an icy mountain. The ice signifies the ignorance of a frozen and static consciousness (the waters of Hindu scriptures). The word "Si" means cool (sheetal) and the word "va" to live (vasa). The word "Siva" therefore means, He who lives on the top of cool mountains (of frozen consciousness). He is not generally worshipped in his original physical form (as a mula murthi), but mainly as Sivlinga, the phallic symbol signifying creation as the combination of Purusha and Prakriti. He is also worshipped variously as Nataraja, Dakshinamurthi, Ardhanarishwara, Virabhadra, Chandeswara, Pataleswara etc. Worship of Divine Mother is equally popular in India. As the ruler and creator of the worlds she attracts a large following across the length and breadth of the country. She is worshipped both in her peaceful forms and her fierce forms. On the positive side, she is the personification of love and peace, providing solace to her devotees. Though She was known originally for her fierce form and association with esoteric rituals of Tantrism, Shri Adi Shankaracharya brought her into the public glare through his famous work "Saundarya Lahari" and his travels to various parts of the country and made her acceptable to a majority of Hindus in Her most benign form as the Mother of unbound love. Shri Ramakrishna Paramhansa, one of the greatest saints ever born on earth, proved through his own personal experience that anyone with true devotion and purity of their hearts and minds can seek her blessings and guidance. She is worshipped as Lakshmi, Saraswathi and Uma or Parvathi. In her fierce forms she is worshipped as Kali, Karali, Bhairavi, Bhavani, Chandi, Durga etc. The many schools of Tantrism regard Her as the Supreme Deity and worship Her in various manners. She is most popular as Goddess Durga in eastern India and elsewhere also. During the Durga Festival She is worshipped continuously on a grand scale for nine continuous days during which many devotees observe fasting, taking nothing but water during the whole period. The Hindu gods are real and true manifestation of the Supreme Self. They are a part of Hindu consciousness. They impart beauty, variety and charm to the very practice of religion. It is difficult to conceive of Hinduism without their presence. Many Hindus worship the Navagrahas or the nine planets mainly to ward off adversity and evil influences. Generally, they are not worshipped in homes but in temples. These planet gods play a key role in Hindu astrology. The Navagrahas are, 1. Surya (the sun), 2. Soma, or the moon, 3. Managala, Kuja or Angaraka, (mars), 4. Budha (Mercury), 5. Brihaspati (Jupiter), 6. Sukra (Venus), 7. Sani (Saturn), 8. Rahu and 9. Ketu. People generally worship these planet gods to appease them and ward off evil and negative influences. The Ashtadikpalas or rulers of the eight directions also need special mention. They are not generally worshipped as individual deities but addressed in many invocations during important rituals and Vedic ceremonies. They also play a vital role in Vasthu Shastra (the science of construction). East is ruled by Indra, west by Varuna, North by Kubera and South by Yama. Among the intermediate directions, north east is ruled by Isvara, north west by Niruthi, south east by Agni and south west by Vayu. The discussion would be incomplete without the mention of the following deities who have become very popular in modern times. Vignesha, the son of Siva and Parvathi, the leader of the devas. Lord Venkateswara, the lord of the seven hills from Andhra Pradesh, who is considered a manifestation of Lord Vishnu. Lord Jagannatha of Puri, who is also considered an aspect of Vishnu. Hanuman, of the Ramayana fame who is known for his devotion and unconditional love for Rama. He has numerous temples all over India. Kartikeya or Swami Ayyappa or Kumaraswami who is the second son of Shiva and Parvathi and has a wide following in many parts of India especially in the South. Nandi and Garuda, who are the vehicles of Shiva and Vishnu respectively. They are not as popular as the others, but they are well known and receive a lot of attention for their association with the main deities.